When my now-husband and I got engaged and sat down to talk about the kind of wedding we wanted to have I think I surprised him. I told him I wanted to have a religious ceremony with lots of flowers, no reception, and a one-month honeymoon. I told him everything I knew about the Camino. My husband who hates everything about weddings and loves doing outdoor stuff was thrilled with the idea. We could not afford to do both the reception and the honeymoon of our dreams, so we decided that it was more important to have a transformative honeymoon than a big beautiful party. We were going on the Camino with the hopes that it would allow us to get to know each other better and fall deeper in love. So the planning began. 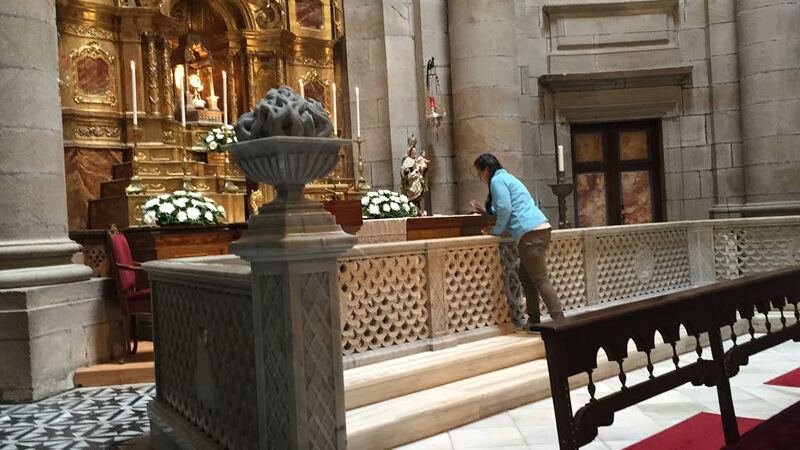 As we were preparing for the Camino, I had posted on Facebook and sent an e-mail to all our family members, friends, co-workers, and Diaconate community, telling them that if they had a prayer request, I would carry it all the way to the Cathedral of Santiago de Compostela. Each prayer that I received, I wrote in the journal that we would take on the Camino. 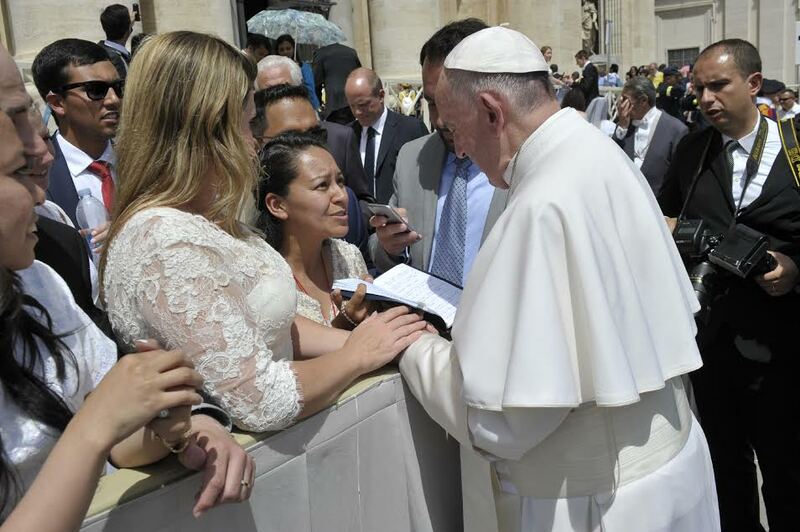 This journal was blessed by Pope Francis in our stop to Rome on our way to France. We got married on May 21, 2016, in Yorba Linda, California. 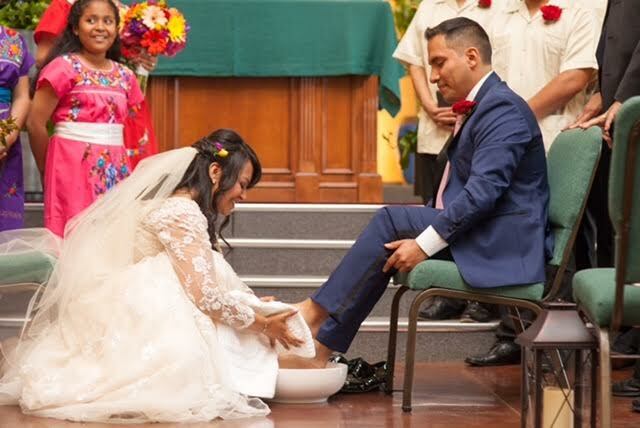 Our ceremony included a ritual “the Washing of the Feet” that represented service—service to each other and also a cleansing of our feet in preparation for the Camino. 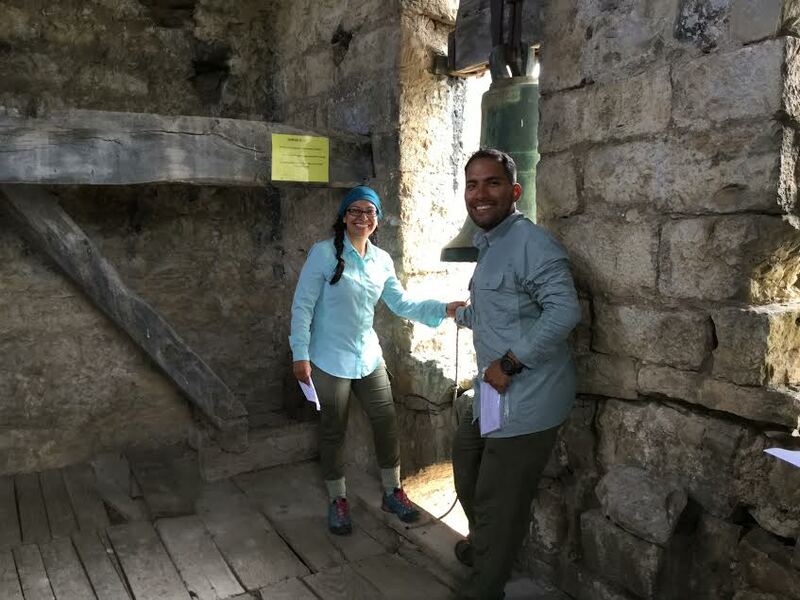 Before we left the Church, we had changed into our Camino clothes, grabbed our backpacks, received blessings from our guests, and walked through a long line of friends and family who had written notes for us of what to take on the Camino. They would place the notes inside our backpacks, as we would pass by. The notes said something like, “Don’t forget to bring LOVE, PATIENCE, JOY, etc.” It was a beautiful moment. Arriving in St. Jean Pied de Port was exhilarating, walking into the Peregrino Office and purchasing our Pilgrims Passport was exciting. We could not wait to start our journey. The first day on the Camino heading to Rocensvalles started out wonderful: we were meeting new people, making friends, admiring the breathtaking view. Then all of a sudden, I started feeling pain in my knee. The pain got so bad that I would have to stop to cry for a few minutes and then continued walking. When we arrived in Roncesvalles I was dead tired, my entire body ached, and I could hardly move my knee. The first week on the Camino was the most beautiful but the hardest. We could not figure out how to communicate well, priorities were different, and it was just simply hard to work with our personalities. At some point in that week, we almost decided to go back home. However, we soon realized that to finish this journey we would need to learn to become a team. So we did. 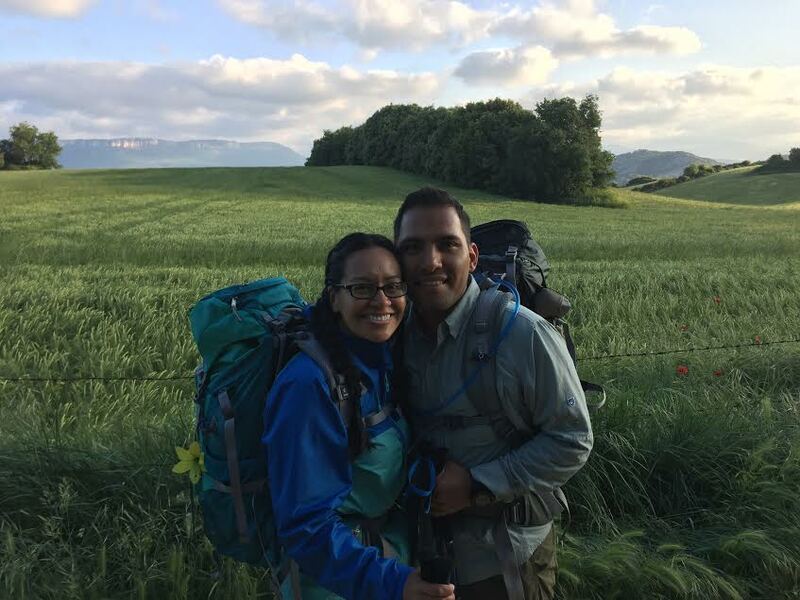 The Camino provided us with many blessings along the way, but the biggest blessing was the ability to walk next to my husband for twenty-nine days and to get to know him better. I learned about his childhood, his dreams, his fears—some new stories I had never heard before. Every day we would start our walk with a dedication of the day and a prayer from our journal. When people found out that we were on our honeymoon they would think that we were crazy. But we could not think of a better to celebrate our love. One of my favorite parts of the Camino was the day we arrived in Santiago. We had decided to wake up really early to beat the crowds so that we could have the opportunity to walk alone. We started our walk around 5:00 a.m. while it was still night. Going into the forest was probably one of the scariest moments of my life. It was almost pitch black, the only light we had was from the headlights we were wearing. All along the walk I was holding my husband’s hand for dear life. It was terribly scary because we could not see ahead of us very well—we were afraid that animals would attack us, someone could hurt us, or that we would simply miss the arrow. We finally reached the point where we could see the moon and a bit of light. In that moment we realized that our journey as a married couple would be similar to that walk. We are walking together sometimes not knowing what’s ahead of us but knowing that we have each other’s light to guide us. When we arrived in the Cathedral of Santiago de Compostela we encountered a group of friends we had met at the beginning of our trip which brought us lots of joy. We attended the Pilgrim Mass in the Cathedral, and to our surprise, the announcer welcomed us by name, he said in Spanish, “le damos la bienvenida a Oliver y Lucy de California que vienen haciendo su luna de miel en el Camino.” “We welcome Oliver and Lucy from California who are celebrating their honeymoon on the Camino.” Another blessing, another moment of joy and celebration. When the Mass was over, we walked over the little chapel inside the Cathedral where the Blessed Sacrament was exposed and we dropped off the prayers request from our community. 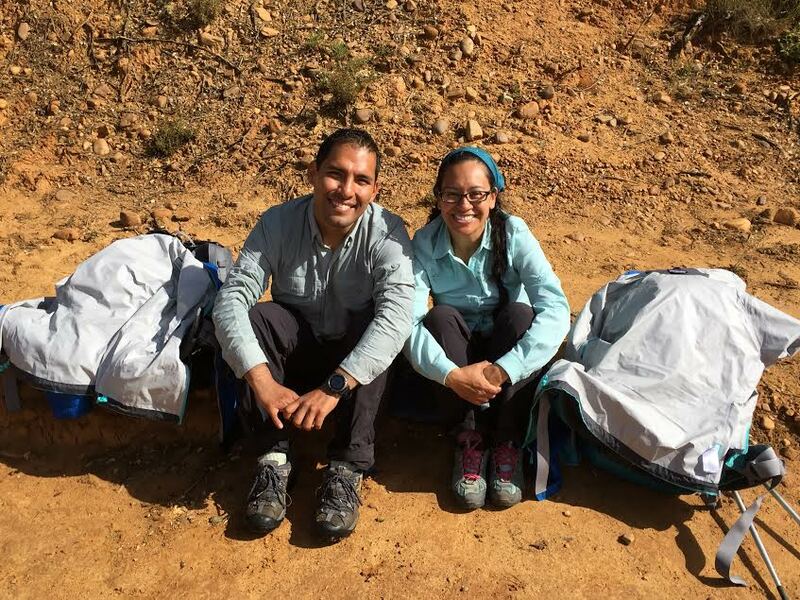 Our Camino honeymoon gave us the opportunity to practice patience, to live free, to be tolerant, to learn, to love, to accept, to enjoy, and most importantly to be present to each other. I could have never imagined that I would receive the gift of time, a time that I got to share with my husband the two of us alone. Whenever there were disagreements we would not have anywhere to go: there were no gyms on the Camino, we did not have any of our friends or family members to call—it was just us. My favorite part of the Camino was having that quality time alone with my husband for those twenty-nine days. So, because our honeymoon was so awesome, we decided to go back and walk for our five-year anniversary, ten-year anniversary, fifteen-year anniversary, and so on until our bodies cannot handle it anymore. In the meantime, we continue to share our story in the hope that it will inspire other couples. We would like to express our deepest gratitude to the Camino for providing us a wonderful way to begin our lives together. This is a short video of our last week on the Camino. We hope you enjoy. Thank you for following our journey. Video and photos courtesy of Lucy Dominguez and Oliver Lopez. Felicidades Lucy and Oliver! 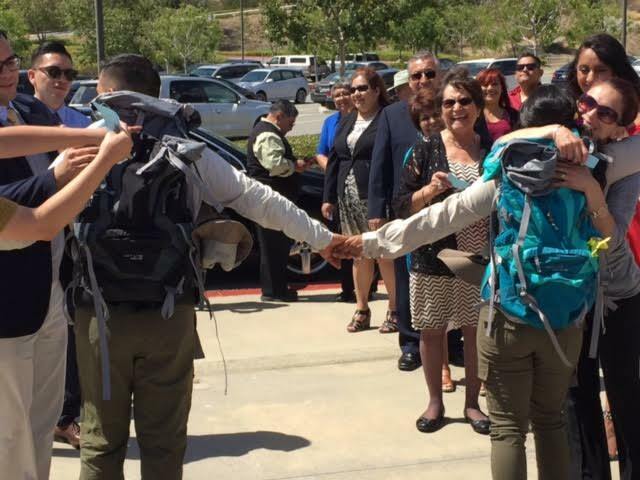 What an incredible way to start a journey of life together. 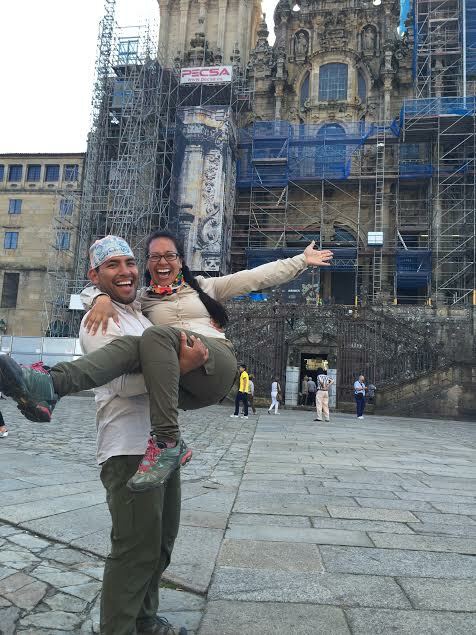 Thank you for sharing your beautiful Camino honeymoon story. My fiance and I are starting our pilgrimage in a few weeks. We have been planning this trip long before we started dating and are both so excited for our journey to start. We plan on getting married towards the end in the Galacia area. If you have any advice, we would love to hear it. Congratulations to you both! Please keep us posted on your wedding. You can be the first Camino wedding couple on this website! Enjoy the journey, don’t sweat the small stuff, and buen Camino! What a great idea Lucy! 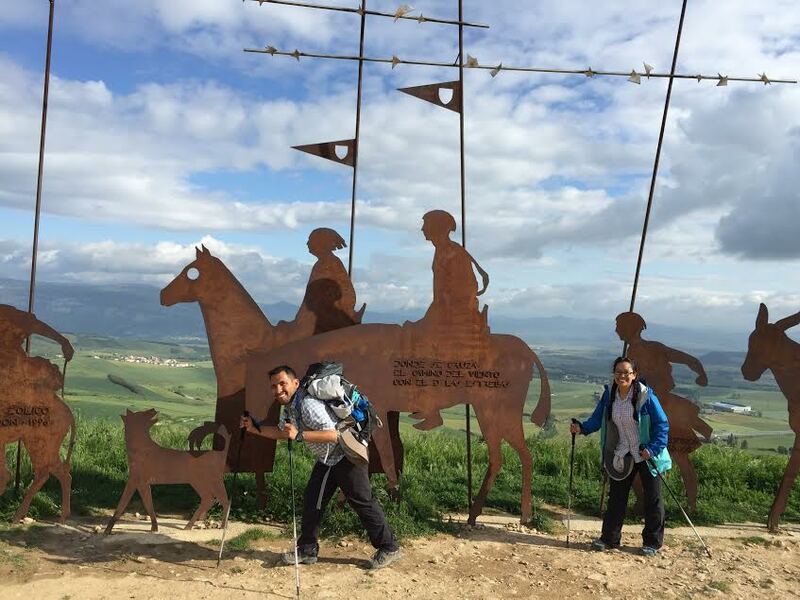 My sister and I walked the Camino Frances in 2014. We’re working on an art project, NuestroCamino, about our journey and are looking to include stories from our fellow pilgrims. We’d love to have something from you and your husband! If you’re interested, you can find more details on http://www.heatherharrisart.com/nuestrocamino/#involve.